Myles Winbigler’s herculean effort to have his 1959 Sadler Formula Junior (known to all as “Aunt Marge”) rebuilt in time for the BCHMR was greatly appreciated by both the VRCBC and our special guest, the car’s constructor Bill Sadler, who thus had the opportunity to do some laps in one of his earliest racing cars for the first time in over 50 years. Unfortunately, Myles was unable to attend the BCHMR due to family commitments. 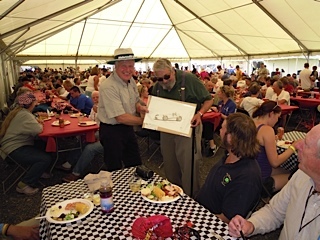 So on behalf of the VRCBC and Bill, at the SOVREN Historics event on the July long weekend, Ian Wood presented Myles with an original Billy Richards drawing of the Formula Junior in action .